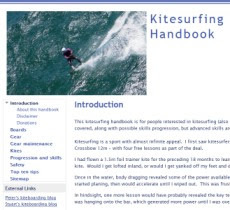 This is an online blog journal of all my kitesurfing activities. I blog and log every kitesurfing session and provide information on skills progression, gear, weather and locations. I am based in Melbourne, Australia where we are blessed with good winds and some wonderful kitesurfing. I also take kitecam photos and video. I also record many sessions with a GPS. Session 371. Last day of Easter holiday and some late wind. The crew selected St Kilda as the best wind location. There was almost nobody there, which is quite a change from the peak of summer. The wind wasn't very strong, around 15 knots. I was tracking well on the Nugget. Tarren, Stuart and Job all took off downwind towards Port Melbourne. I didn't fancy a long walk back so I stayed near the breakwater. On one occasion I came in close the end of the breakwater, looking out for fishermen in case anyone had their line in the water. I figured none would be there due to the Fairy Penguin colony that is there. Suddenly I spotted to fishermen! I thought I was still far enough out to avoid their lines but no, I snagged one. I stopped immediately to sort it out. He was winding it in. Eventually the sinker and hook came up over my bar and flipped away. Whew. Lesson learned - keep well away from breakwaters. I came into the beach and packed up, ready to drive down to pick up the others. The wind lifted though so they were able to make it back. Alls well that ends well. It was cool in the water. Winter is coming. Session 370. It had been a few days since my last session and that desperate urge to kitesurf was again building. The wind was light all day and into the afternoon but it strengthened around 4pm so I headed to St Kilda. On arrival, it was not too busy and the wind was good. After launching a beginner (whose kite was under inflated - a common mistake) I got going on the Union 10 and the Sector 60 board. I haven't used the Sector 60 for a while so I was keen to get on it again. A great session! My first run was out to the shipping channel. I could see down to the Spirit of Tasmania and could see fumes coming out of its stacks as it prepared to leave the dock. I then headed for Elwood and saw a kite in the distance. It was on Ozone Edge 10 and the kiter was on a foil board. He turned near me then headed on a similar tack. Nice to watch that foil slicing through the water - its like flying - and I estimated he was going 30%+ faster than I was on my upwind machine. Coming back I rode some good swells. The Sector 60 turns well, better than I remembered. All that surfing on the Nugget has improved my turns perhaps. Back in St Kilda the wind was softer behind the breakwater. I did some more good runs further out and a few jumps - possibly my biggest ever on the Sector 60. Kitesurfing off Hampton, mixing it with the big boys and not much wind! Session 369. There were some storms and fickle wind during the morning but it looked like the wind was OK after lunch. I got Hampton and kites were out and a race of big yachts was in progress further out. I got on the water in haste and headed out in good wind. I thought I might be cheeky and get some good photos of the yacht race. As I got closer to them the wind softenend. Hmmn. I was cautious getting through the line of yachts then waited for a good gap to head back in. The wind was getting even softer so now it was a case of get in back to shore as soon as possible. I was lucky the wind held up enough so I could make it back without a (long) swim. I landed at the Middle Brighton beach. Job had followed me down in his car to check all was good (thanks!) and was on his way. Its good to have friends around when you are kiting. Back at Hampton I chatted with Paul who was about to head out on his foil board and 13m kite. The wind was around 10 knots but he was able to get going well. I left my foil at home though, so I headed off for a coffee and muffin. Going through a yacht race is dicey - the waves are all chopped up and yacht sails create wind turbulence. If you have lots of wind its is easier though. It is of course important to keep well away from all yachts. Around 100m is a safe distance, 50m is a minimum. Kitesurfing downwinder Ricketts to Brighton makes for a happy birthday! Session 369. Kitesurfing downwinder makes for a happy birthday for me! Organised a car shuffle with Stu Styles & Stu Webb between Brighton and Ricketts. My car is the "return vehicle" as I have neoprene seat covers that cope with wetsuits. The wind at Ricketts was good and the four amigos were soon on their way. Much better wind than our last downwinder here. Surfed some nice swells down to the Cerberus and kited past it a few times. I still think this historic vessel should be taken out of the water and restored. The small surf was really nice between Red Bluff and Sandringham Yacht Club. I did a big jump coming out from behind the breakwater, and few others during the day. I surfed Green Point and the reefs down to Brighton Beach then I did few runs out and back. Surfing past "usual spots" on a downwinder provides a different perspective. How lucky we are to have this wonderful bay and good wind right in the heart of Melbourne. It was a very happy birthday for me! Session 368. We headed for Beachport after breakfast in Robe (delicious pippies!). The wind was around 15 knots when we arrived but soon picked up. I assembled my foil board and took it out into the waves for another humbling experience. Once again I found it difficult to get out through the waves and body drag, even with the foil upwind. The waves were turning the board in all directions. I thought I would struggle with the weed and swell even if I did eventually get out so I came in and swapped the board for my trusty Nugget. Then I spent some frustrating minutes resetting my lines before I was out and fanging around nearly overpowered. The waves were good and the wind was strong - up to 25 knots. Everyone was blasting around catching waves and boosting big. What a place, its the gift that keeps on giving! Stu lost a fin from his Secret Weapon and had a brief look for the needle in a haystack on the beach. I drove up the steep dune access track onto the beach and down to pick him up. The Kitewagon handles the steep and very well. We stopped mid afternoon with energy levels well depleted then headed into Beachport where we ate some lovely bratwurst with sauerkraut, had a coffee then started the long drive home of around 6 hours. Kudos to Stu for scoping out such a good wind forecast at a great location. We were all "kited out" on this trip! Flailing with the foil board! Its a long pier - over 700m! Session 367. After lunch and a short rest we checked out the west side of the headland but the wind was cross shore and there was quite a walk to get down to the reefy beach, so we drove down the Robe beach. There is vehicle access and the sand is good to drive along. We continued down until the wind picked up and the waves were bigger then setup and headed out. The wind was a bit offshore so keeping the kite flying was a tricky close to shore. Once out there was enough wind to get going. Some good wave sets were coming in. We took turns picking a good wave then riding it in. I did some figure 8's with the kite to get on some waves. The surf was really nice. We headed downwind following the waves for a long and enjoyable session. After a while I looked back at the distant cars and decided the walk back was long enough for me so I landed my kite, packed it away and left it with my board and harness. The others were continuing on downwind. I walked and jogged back to the car, which took a lot longer than I thought. It was a 2 km walk. I drove my car back to my gear and just as Stu was walking up the beach, looking rather tired. He jumped in and I gave him a lift back to his car, then we both headed down to get the other two. We got back to Robe just on dark so we headed out for meal, each demolishing a large pizza to regain some energy. We were all shelled after the day's activities. This blog records my kitesurfing sessions and skills progression, along with information on gear, weather and locations. I am based in Melbourne, Australia where we are blessed with good winds and some wonderful kitesurfing locations. Great white shark spotted off Brighton!